Dermaplaning is by far the most effective beauty treatment for instant results and immediate benefits. This procedure will leave your skin not only looking instantly brighter and more youthful, but the texture will have dramatically improved, the ‘peach fuzz’ will have disappeared and the benefits of this treatment really do last! This is the perfect treatment for anyone who wants to see drastic improvements in their complexion, instantly, and with the hassle of downtime. Dermplaning is a very simple procedure that requires no downtime, very little aftercare, and for you to relax for 40 minutes whilst being pampered by one of our consultants. Sounds that simple? It is. We start by double cleansing the skin with sterile water and a beauty cleanser. Once the skin feels clean and product free, we scrape the entire surface of the face and neck with a surgical-grade scalpel. This blade is incredibly fine and being held at a 45 degree angle, its allows us to access all contours of the face. Although the term “scalpel” sounds scary- there is no pain at all. The sensation is similar to shaving. 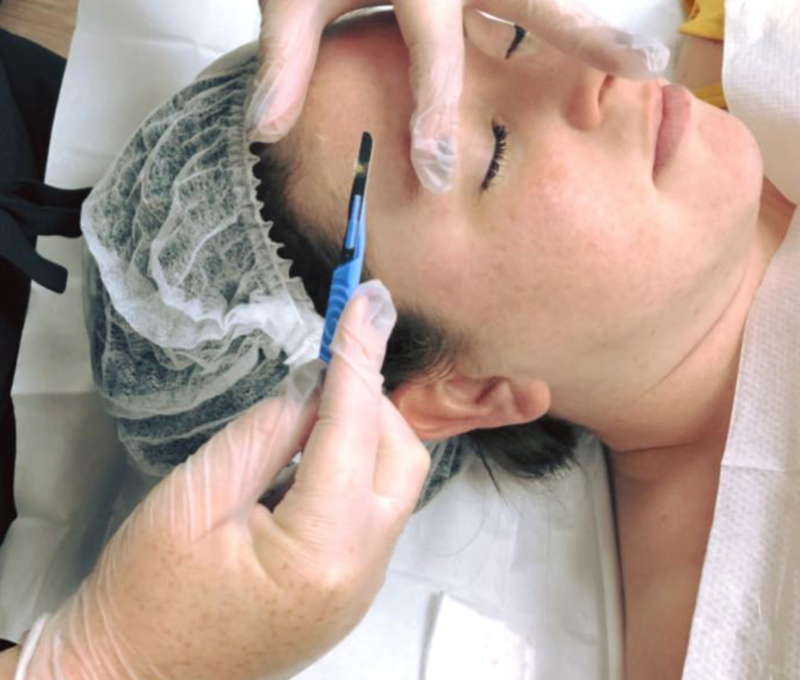 This part of the treatment takes about 30 minutes, and once complete- we leave you to relax for the remainder with a collagen boosting serum and hydration face mask over the face. ALL PRICES CURRENTLY SPECIAL OFFER £200 PER TREATMENT! GET IN QUICK! Dermaplaning planing is suitable for just about anyone! This procedure will help improve countless amounts of skin concerns, however there are certain contraindications that may prevent us from being able to perform this procedure. Please contact us for more information on this. There are no aftercare instructions for you to follow, no particular creams or products required etc. However, we do encourage you to avoid excessive exposure to direct sunlight for the first 24hours, we advise that you keep your skin completely dry, and avoid activities that will increase perspiration (ie-the gym). All of this will be covered during your consultation. Not at all! The sensation is similar to the feeling of shaving with a razor. Drop us a call, email, text or contact us via social media.